You're not a pop culture juggernaut until Mr. Potato Head says you are. Spider-Man? Star Wars? Star Trek? Kiss? Batman? All these were nothing until this starchy Solomon designed to recognize them with a themed Mr. Potato Head toy. And now, Doctor Who is joining this carbohydrate-loaded elite. The Eleventh Doctor as played by "MASH" Smith! Hop in the TARDIS with Mr. 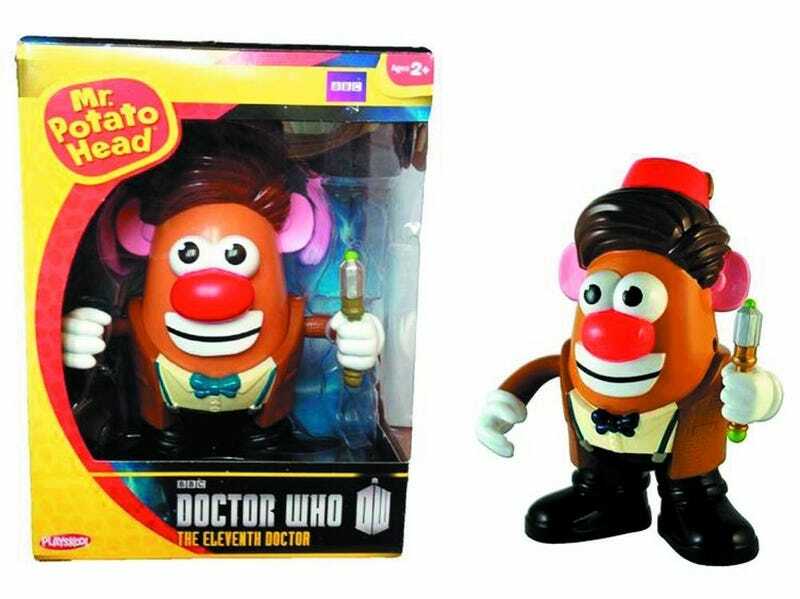 Potato Head as he pays homage to the last known survivor of "Galli-Fry", DOCTOR WHO in his quirky eleventh incarnation! Set comes complete with 8 removable parts and pieces. "Galli-Fry" is pretty great/terrible, but come one, guys, you could have done better. First of all, clearly it should be Doctor Potato Head. Second of all, he should be wielding a Sonic Potato Peeler. And last but not least, he should clearly have been packaged with the T.A.T.E.R.D.I.S.